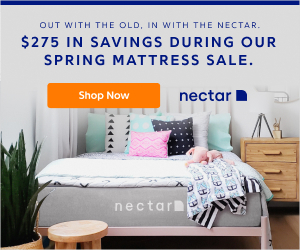 Do you have a Dutch Oven Squatting heavily in your dark basements, attic, or how about your cluttered garage? These three-legged hulks from a bygone era are waiting impatiently to release their treasures. 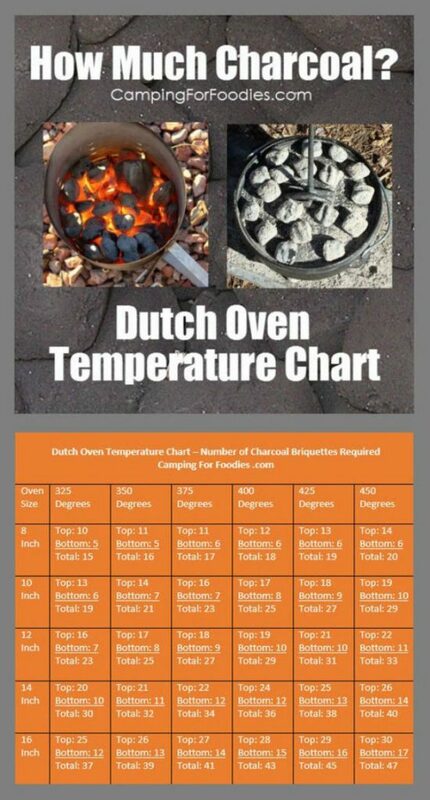 Growing up I do not remember cooking in a Dutch Oven camping. But When I was young and went to Girl’s Camp we always cooked in the Dutch Oven. I Loved the fruit cobbler we made it was YUMMY!! Let me share a Cobbler Recipe From Delish that is so easy and Delicious. I had a friend that went all out Dutch Oven Cooking and won awards for her talent. 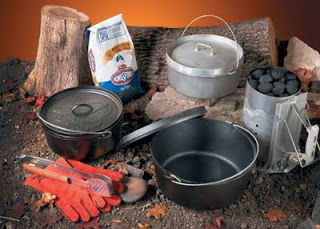 We have a whole box of Dutch Oven pans that we have used camping. But for now they are collecting dust, maybe this summer we will cook in them again. Retirement sometimes changes things. 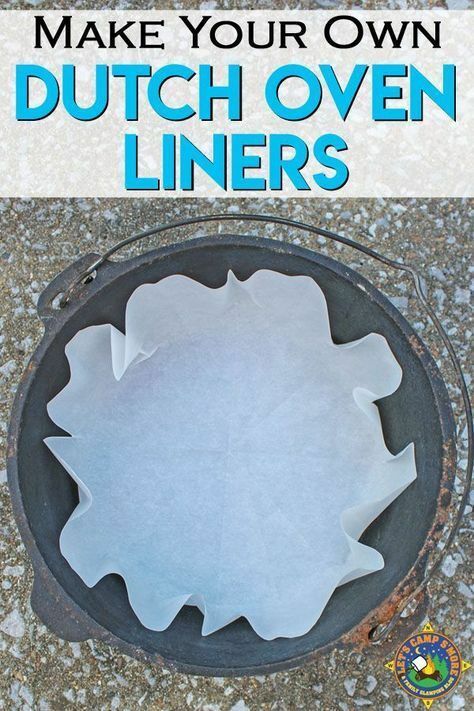 Make Your Own Dutch Oven Liners…. clean up is so easy. This tutorial from Let’s Camp More shows how simple it is to make your own. 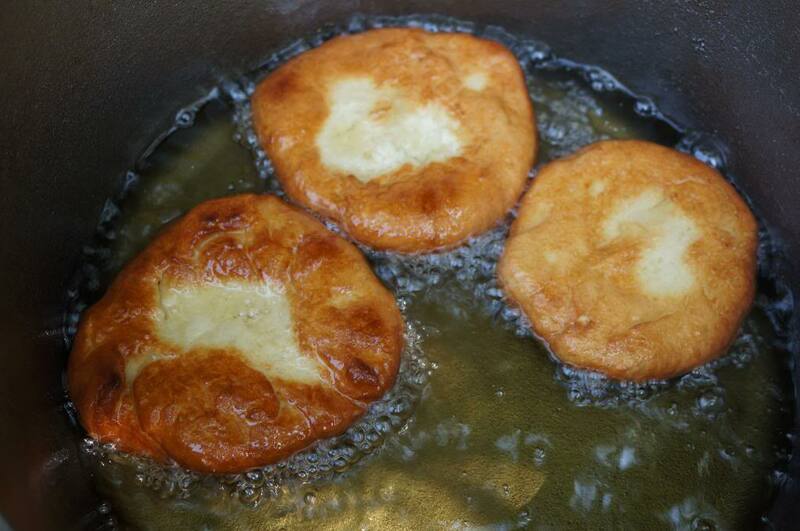 Dutch ovens come in a range of sizes; one of the most popular being the 12 inch since it’s so easy to handle. Do not use a Dutch oven that has not been seasoned. Seasoning prevents rusting, adds flavor to the food and also allows for easy cleanup. On occasion, seasoning must be done twice in order to season the entire oven completely. To season a Dutch oven, peel off the labels, and wash it in warm soapy water. Rinse, drain and dry immediately. Set in on the stove for a minute to make sure it is completely dry before you add a light layer of Crisco to the oven, inside and out. Then bake it in an oven that has been preheated to 350 degrees Fahrenheit. Though it smokes a bit, leave it in the oven for about one hour. Just keep your windows open so the smoke can escape. After cooking, wipe away any remaining grease, and store with a paper towel or piece of cardboard between the lid and the oven. 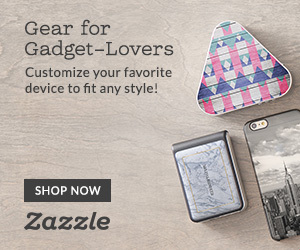 The paper will absorb any leftover moisture. Don’t wait until you are hungry before you start the fire! Build it long before you want to eat. It will take a while for the fire to burn down to coals. How to Simmer – This technique is perfect for stews, soups and chili. Keep 2/3 of the briquettes under the oven and use the remaining 1/3 to cover the lid for even cooking. How to Bake – This technique is for baking breads, pies, cakes and more. Leave 1/3 of the briquettes under the oven and place the remaining 2/3 to cover the lid. How to Roast – If you’re cooking meats, poultry, veggies or casseroles, distribute half of the coals on top and the other half below the oven. 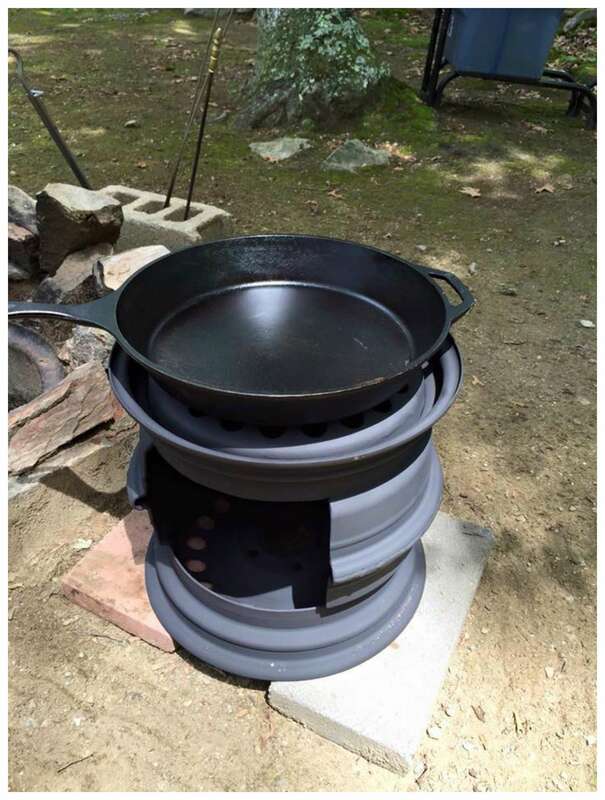 Check Out This DIY Wood Stove You Make From Recycled Tire Rims, and Use It For Dutch Oven Cooking. 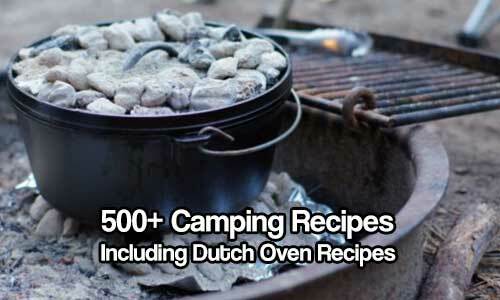 That’s right—over 500 camping recipes that also includes over 100 for Dutch ovens. It’s yours For FREE! Many of these recipes can also be cooked at home in the kitchen or on the barbecue etc. 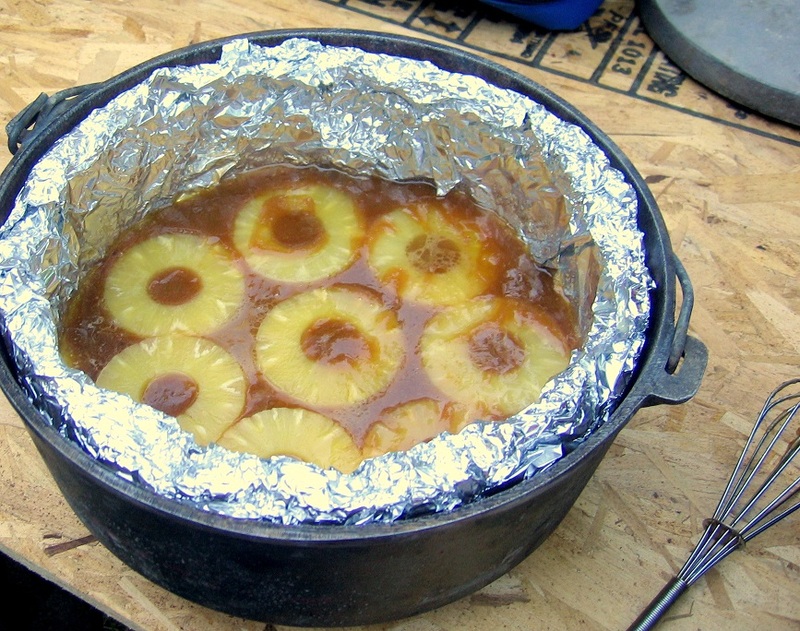 Don’t wait until the weather is nice and you go camping, to try some of these recipes. Download and print out this free PDF cookbook below. minutes or until done. Dredge in cinnamon and sugar. sweetened condensed milk and butterscotch topping over cake. Sprinkle with candy bar. Serve warm with nuts, ice cream, or whipped cream. Dutch Oven cooking Utah 4-H .org. 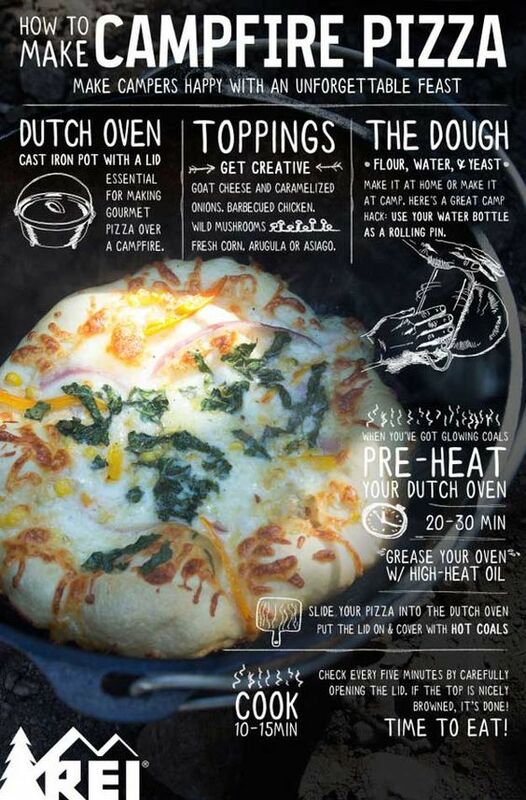 Make Campfire Pizza in a Dutch Oven via Pioneer Settler. 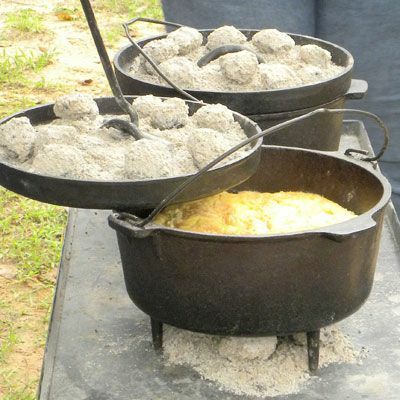 Dutch Oven Sloppy Joes…..Sloppy Joes are a great food when camping and this dutch oven recipe makes them super simple. Click here for the recipe. 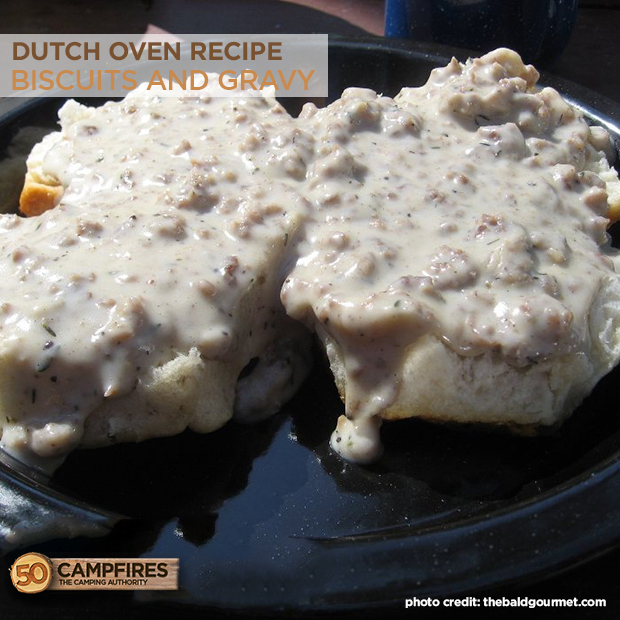 A classic breakfast, biscuits and gravy are excellent when you’re camping. 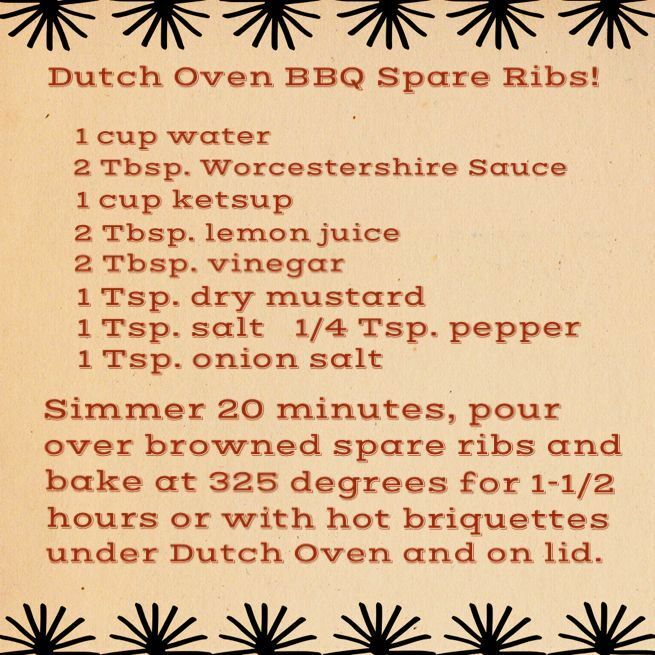 Even better when you can make it in a dutch oven. Get the recipe here. 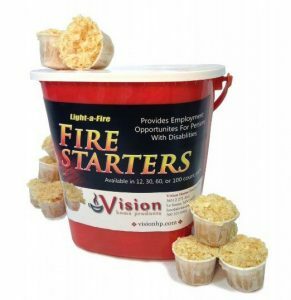 Light-a-Fire, Amazon’s Best All-natural Fire Starter, 30 Pods with Container. 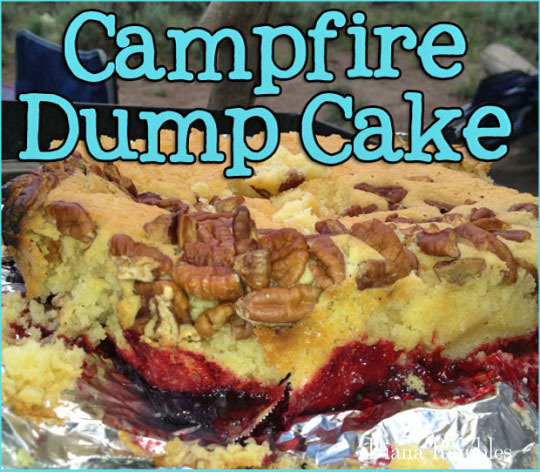 Campfire Dutch Oven Dump Cake Recipe Is a Dutch Favorite Dessert. Just Dump It All In and Enjoy!! 1. If you take the lid off your oven and thee boiled so heavily that you cannot see the food, your fire is too hot, remove a few coals. 2. If you take the lid off your oven and the contents are not boiling after being on the fire for twenty minutes, your fire is to cold, add more coals. 3. If half your food is browning faster than the other, you have a hot spot. Rotate the oven one quarter turn to the left and rotate the lid one quarter turn to the right every 15 minutes until done. 4. Heat rises, some foods such as chicken and potatoes can be cooked with only bottom heat. Anything “baked” needs top and bottom heat. 5. Watch wood coals closely, they burn out quickly and you will need to rotate the oven. 6. When the wind blows it will cause coals to burn faster and hotter on one side. Set up a wind break and be sure to rotate oven. You may have to add more coals to get desired heat. 7. Cast iron conducts heat very well, so put most of the coals on the lid around the outside edge, it will aid for uniform browning. 8. Ash can build up on a briquette. If it starts to build up, remove the ash by tapping the briquette with tongs, DO NOT use hands. 9. Keep the lid on tight, because each time you open it, you lose heat and increase cooking time. 10. You may stack ovens. This saves coals and space. 3 or 4 high is best. Never allow cast iron to sit in water or allow water to sit in it. The pot will rust! Never use soap on cast iron. It will get into the metal pores and taint your food. Never place an empty cast iron oven over a hot fire. It will crack or warp. Never be in a hurry to heat cast iron. It could burn the food or damage the oven. Never put cold liquid into a hot cast iron oven. It could crack! 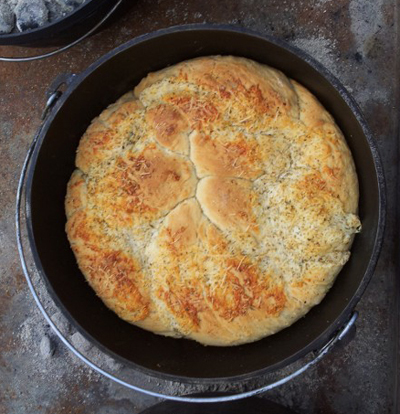 Baking in a Dutch oven is simply amazing – breads and desserts turn out just perfect! 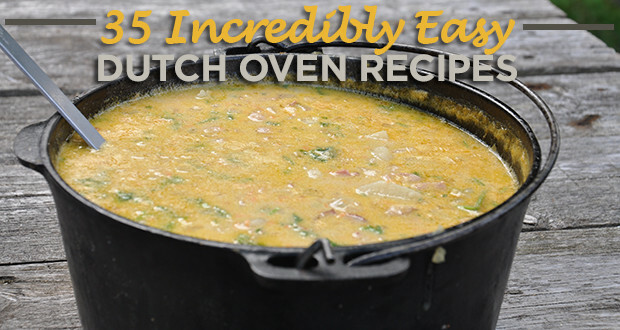 If you haven’t enjoyed Dutch oven cooking as the cook or the eater, you’ve been missing out! It’s a lot of fun. 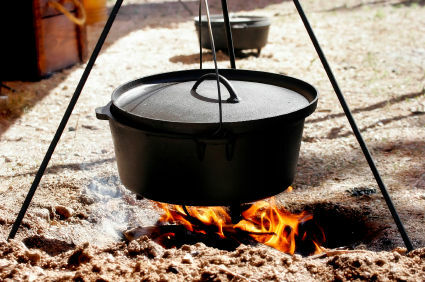 With a Dutch oven and some good Dutch oven campfire recipes, you can create some amazingly tasty meals – and have fun at the same time!